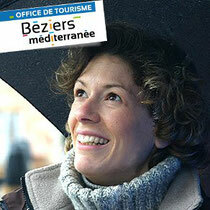 Register for a walk with Peggy - Béziers Méditerranée Greeters, un autre tourisme ! Registering is mandatory and outings with greeters limited to 6 persons only. Meeting point: Tourist Office in the historical center, across the street from the City hall, Place Gabriel Peri. - Visit the roman arena : Discover the roman arena! There's not much left... but it would be a pity not to go! We can even end the visit at the Musée du Biterrois to see the roman collection... and the rest of the museum !